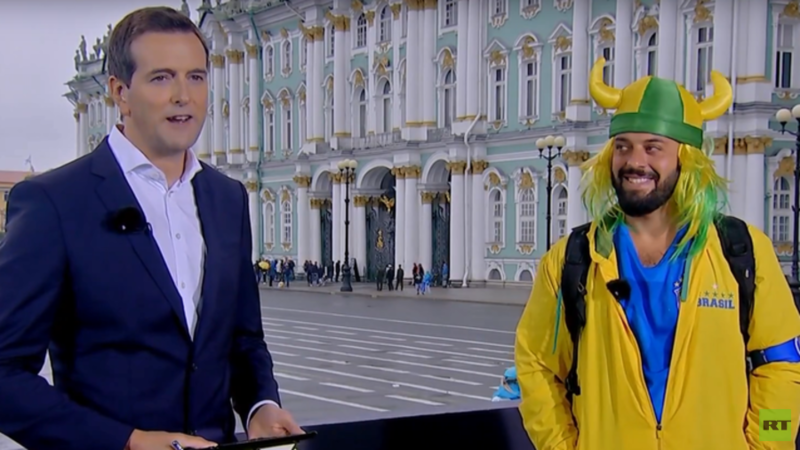 A Brazilian fan, who unexpectedly became famous for his smooth use of Russian expletives, shared his experiences in Russia with RT, revealing the unexpected things he saw in the country. The fan, Tomar Savoia, was filmed ahead of the Brazil-Switzerland match in Rostov-on-Don last Sunday, shouting "Russia is f***ing awesome, bro" in Russian. His simple yet strong words won the hearts of Russian speakers on the Internet, promptly turning the man into a meme. RT reached out to the fan, who's currently in St. Petersburg, chilling ahead of the upcoming game with Serbia. He seems to be very optimistic about his national team, hoping to "follow it up to the final." Savoia revealed that he was actually a journalist, striving to show the World Cup from the perspective of the fans. Savoia shared his experience with Russia and Russians, who turned out to be quite different from his expectations. "The Brazilians thought that the Russian people are angry people, closed people. And it's just a few taxi drivers in Moscow actually!" Savoia told RT. "We're loving you. We're really loving Russia, we're really enjoying Russia. And it's a surprise for me. I'm surprised how warm you are, surprised [with] the hospitality of you." "Russia's the best. I love," Savoia said in Russian with his charming accent at the end of the interview.